Live Heats are held around Australia, in New Zealand and in London. Contestants perform one item of their own choice from their submitted repertoire and the Adjudication Panel may select additional item/s. Contestants are then interviewed by the Panel. The National Adjudicator, assisted by 2 local Adjudicators in each of the cities where Heats are held, selects 10 Semi-Finalists. The IFAC Handa Australian Singing Competition is committed to finding and fostering the next generation of classical singers and the Semi-Finals are instrumental in achieving this aim. Though the highlight of the Semi-Finals is the public concert, the Semi-Finals are actually a week-long process for the singers, encompassing a Workshop, a Private Adjudication Session and, of course, the Semi-Finals Concert. This stage of the Competition is not simply about pitting one singer against another, but also about helping the singers develop as artists. Indeed, education is a cornerstone of the IFAC Handa Australian Singing Competition. During Semi-Finals week, the participants are treated to a private Workshop with the National Adjudicator and carefully selected industry professionals. In previous years, these Workshops have covered topics as diverse as ‘On the Rehearsal Floor’, ‘Business Management’ and ‘Networking for Singers’. In 2017, National Adjudicator Catrin Johnsson presented a Workshop titled “The Singing Actor”. Find out more about our Workshops. As Semi-Finalists, the singers are required to prepare no less than four items of music that must include a work by a Classical or Baroque composer (such as Monteverdi, Handel, Bach or Mozart) and a song for voice and piano (such as a lied, art song, or chanson). The Adjudicators hear any or all of these pieces in the Private Adjudication session held the day before the Concert. After the Workshop and the Private Adjudication, the ten singers compete one last time at the Semi-Finals Concert. Each singer presents two pieces, one of which must be an art song. This requirement was intended to encourage young classical singers who wanted careers outside the opera domain, and remains a distinctive element of the Competition. From the ten Semi-Finalists, only five will be selected as Finalists. These five will appear at the Finals Concert accompanied by the Opera Australia Orchestra. Since 1982, the IFAC Handa Australian Singing Competition has showcased thousands of singers who have competed for more than $2.8 million in prizes. The Competition’s strength is founded on its reputation for discovering the very best emerging talent from Australia and New Zealand. 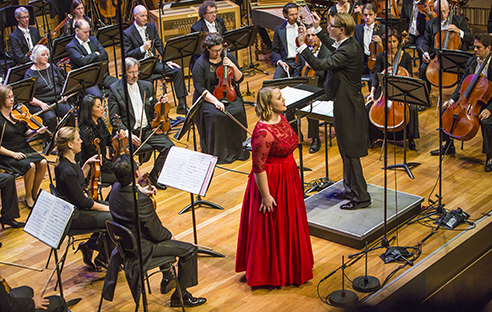 At the Finals Concert, Finalists compete for the prestigious Marianne Mathy Scholarship (‘The Mathy’) as well as a range of other prizes and career opportunities which, combined, make the IFAC Australian Singing Competition the richest and most prestigious competition of its kind. After winning ‘The Mathy’, singers such as Rachelle Durkin (2000), Amelia Farrugia (1993), Stuart Skelton (1991) and Paul Whelan (1987) have all gone on to achieve national and international acclaim. The Finals Concert represents the last stage of the Competition. Unlike the Semi-Finals, where the singers are assessed in a Private Adjudication session as well as in the Semi-Finals Concert, the Finals Concert is the only chance that the Finalists have to perform for the Adjudicators. For many years the Competition has provided Finalists with the opportunity to perform with a full orchestra. This year we continue our successful collaboration with the Opera Australia Orchestra courtesy of Dr Haruhisa Handa and the International Foundation for Arts and Culture. The Finalists may choose to perform for the Adjudicators any two pieces from the operatic canon including Baroque, Classical, Romantic, Modern, Opéra Comique and Operetta. At the conclusion of the Finals Concert the National Adjudicator announces the winners of prizes and opportunities and, finally, the recipient of ‘The Mathy’.